Directions: For best results, bathe animal with TheraNeem® Pet Shampoo or TheraNeem® Pet Soap. Once dry, apply liberally from head to tail and massage well into the skin. Do not spray in or around animal’s eyes, nose or mouth. Use regularly as needed. Safe and effective for dogs 12 weeks and older. Due to the essential oil content, this product is not recommended for use on cats. 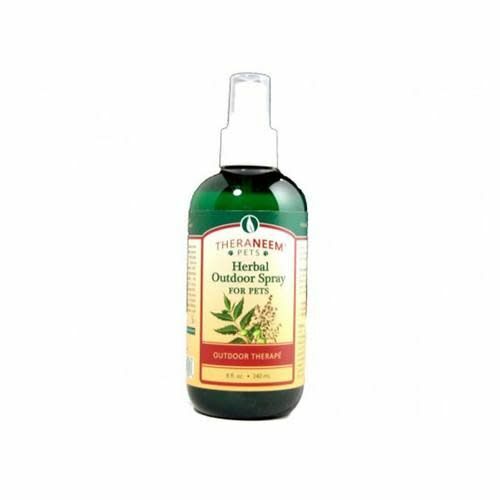 Ingredients: Aqueous Extract of Azadirachta Indica (Neem) Leaf*, Melissa Officinalis (Lemon Balm) Leaf* and Rosemary Officinalis (Rosemary) Leaf*, Mentha Piperita (Peppermint) Leaf*, Aloe Barbadensis Gel*, Azadirachta Indica (Neem) Oil*, Polysorbate 20, Lavandula Hybrida (Lavandin) Oil, Rosemary Officinalis (Rosemary) Oil, Citrus Cymbopogon Schoenanthus (Lemongrass) Oil , Potassium Sorbate, Juniperus Mexicana (Cedarwood) Oil, C10-30 Alkyl Acrylate Crosspolymer, Thymus Vulgaris linalool (White Thyme) Oil, Azadirachta Indica (Neem) Leaf Supercritical CO2 Extract*.